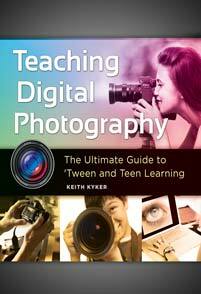 Linworth Libraries Unlimited, a division of ABC-CLIO, has released Teaching Digital Photography: The Ultimate Guide to ‘Tween and Teen Learning. The price is $45, which includes a full-year Digital Photography/multimedia curriculum, and a CD-ROM containing editable versions of all project plans and rubrics, and dozens of images for student practice. You can learn more about this book on the ABC-CLIO web-site. Amazon.com is also selling the book, and offering a 10% discount, taking the price to $40.50.